Ok, I have to admit, not all of the food we eat for Passover is bad. There are plenty of yummy dishes to eat at the seder – tsimmis, matzoh ball soup, flour-less chocolate cake, and of course macaroons. Shockingly enough, I am actually very excited to celebrate Passover in Israel this year. More specifically, I’m excited to celebrate the holiday Sephardic style and eat plenty of rice and legumes, which are not considered kosher for Passover in the Ashkenazi culture. After all, when in Israel, do as the Israelis do, right? 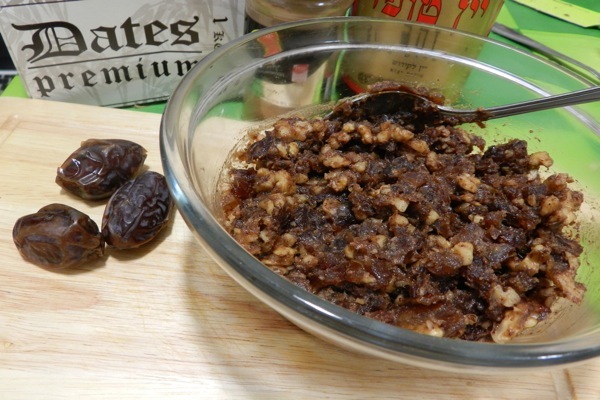 In researching traditional Sephardic seders, one of the foods that caught my eye was the charoset. Symbolizing the mortar used by enslaved Jews to build Pharaoh’s pyramids, charoset is made with apples, chopped nuts and spices in the Ashkenazi culture. Sephardic and Israeli charoset is made with dates, giving it a thicker, more pasty consistency than the chunky Ashkenazi version. Sweeter, denser and definitely more filling than the charoset I’m used to, it was easy to make and authentically Middle Eastern in flavor. Passover this year is already shaping up to be an interesting – and dare I say tasty? – experience! Adapted from Ruth Hegies’ recipe, with extra input from my Israeli roommate, Ruthy! 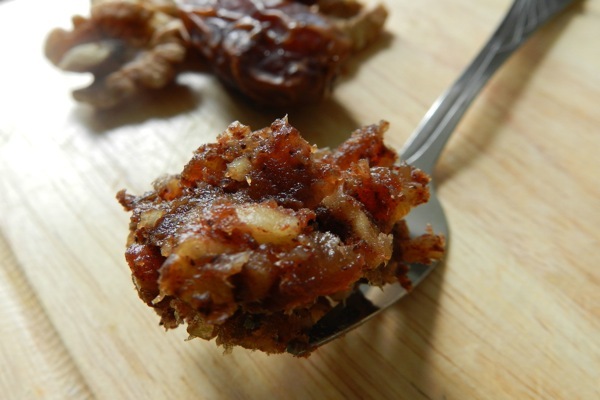 Note: I used walnuts to make my charoset, but almonds are also recommended for Sephardic charoset – a combination of the two would also be good! Make sure the dates and nuts are finely chopped; combine in a medium sized bowl. Add enough wine to make a thick paste – you probably won’t need a whole 1/4 cup, so add the wine in small increments until you get a thick enough consistency that is to your liking. Add the cinnamon and mix well. Serve alone, or more traditionally, with matzoh. I’m jealous – enjoy your Israeli/Sephardic Passover. I’m with you on the annoyance at Ashkenazic restrictions, but solve it by “adopting” the Sephardic traditions. Why not? After all, it’s OK to have flourless chocolate cake that spends an hour rising in the oven, so a few legumes seem perfectly reasonable. BTW – try these Passover rolls that my grandmother, mother and I have made for decades. http://motherwouldknow.com/journal/passover-miraculous-unleavened-rolls.html They use matzah meal so they are OK, tho (like all cakes & macaroons) they bake for far longer than 17 minutes. I couldn’t agree with you more, Laura! My rabbi actually just recently told my mother that most Jews magically become Sephardic for the week of Passover, and that it’s perfectly fine! I don’t need any more convincing to go Sephardic this year, and who knows, maybe I’ll start incorporating some Sephardic traditions into my future Passovers. I will definitely have to try out your family’s Passover rolls – thank you for sharing! Pesach sameach!